Why does good cover art happen to bad video games? It's a mystery as old as...well, uh, I guess its not that old. Nor is it particularly mysterious: completely separate people are involved in programming a video game, and creating the cover art based on the concept of the video game. Nevertheless, some truly embarrassing games have undoubtedly pulled the wool over many a gamer's eyes with some fancy-pants cover art. But now the time has come to reveal the game's true colors: welcome to my first "Re-Create the NES Cover Art with In-Game Footage" article! 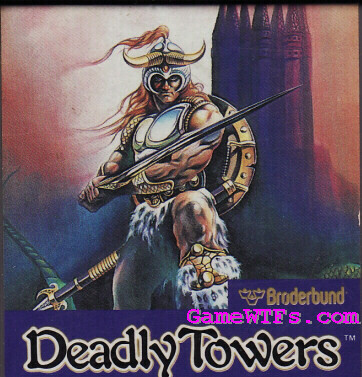 The Cover Art: Deadly Towers call for a Deadly Warrior! We're promised a mighty warrior in brilliant armor with an awesomer-than-viking helmet, his legs and arms a grotesque mishmash of muscles and veins! His fearsome red hair flows in the breeze, and he wields a sword that might be almost as tall as he is! In the background, a many-spired tower looms, menacingly -- is that the titular tower, in all its Deadly-ness? The Game: Pale Pudgy Cow-Man stumbles about, tossing butter knives. Uh, so, yeah. The towers don't loom in the distance, as much as "form the wall you walk in to," complete with goofy little gremlin faces. The musclebound warrior in burnished armor more closely resembles a toddler wearing pots and pans...and the awesomer-than-viking-helmet actually makes you look more like a bull than anything else. And your mighty sword? Well, that's the biggest piece of bull in the game: many beginning enemies take upwards of 10 hits to kill with your pathetic, slow-moving, only-one-on-the-screen-at-a-time sword-projectile! 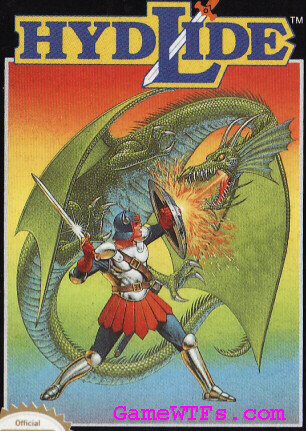 The Cover Art: A Mighty Knight of Glittering Sword, Locked in a Life-or-Death Duel with a Fire-Breathing Dragon! Nothing says "Role-Playing Game" as clearly as this cover. Your warrior is again clad in form-fitting armor. A horned vaguely samurai-like helm sits atop his head, and shining sword and shield stand at the ready, deflecting the scorching breath of a curled and sinester dragon. Undoubtedly the game within will involve many enjoyable hours of level-grinding and resource husbandry*, as you strive to upgrade your beginning-of-the-game WET NOODLE + PAPER HAT all the way from DAGGER + CLOTH ARMOR, SHRTSWRD + LEATHRARMR, eventually terminating somewhere north of GLAVGUSRM + FULPLATE! *: this does not mean having marital relations with goldpieces. There is, indeed, a fight with a dragon in this game...however, like the rest of Hydlide, it is underwhelming in the extreme. In that epic battle (pictured to the left), the vicious fire-wyrm can barely be distinguished from the small piece of shrubbery he's hovering over...which is approximately the same size as him. Makes the little word "DEFEND", at the bottom right corner of the screen, flip to the word "ATTACK"
Radically increases the rate at which you, yourself, are injured, if they happened to be belly-bumping you back. ...no animation of the actual "attack" is present (presumably, for budgetary reasons, and/or to limit the excitement the game can cause). Add to that the fact that you STILL have to do level-grinding, there's no "Buying" or "Towns", just leveling-up for more HP and STR, and the items you gather generally have no visual representation in-game (pick up the cross, and you can hurt the vampire when you briskly rub shoulders with him...don't have it and you can't), and you have one of the worst "cover art to game" disparities in the NES's mammoth library! 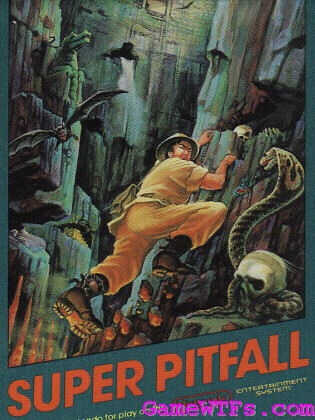 The Cover Art: Snakes! Why did it have to be snakes? The Game: Sock Puppets! Why did it have to be sock puppets? ...honestly, I couldn't find a screen that had more than 1 or 2 enemies on it, so I don't feel too bad just comparing the amazingly menacing cobra from the cover art to Slimy the Worm from Seasame Street that is his in-game representation. No, resource husbandry means making gold pieces have marital relations, in the hopes of producing more like them!